… And off to the West we go!!!! With the models Radianting in their makeup, Donna Karan shows off a Chic, Western inspired collection. 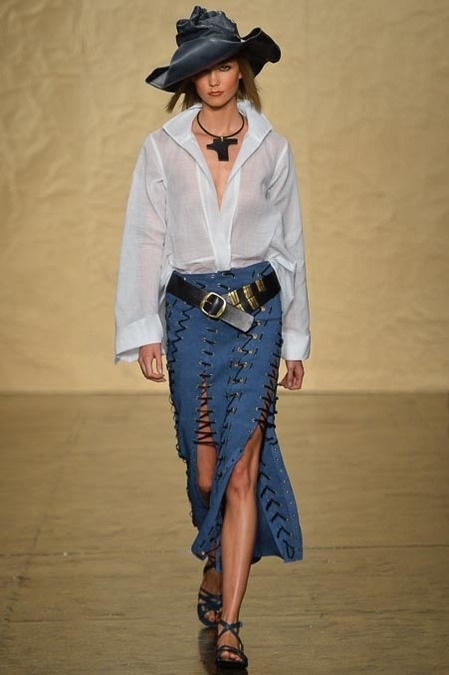 Starting with Beautiful blue dresses, and belts around the waist in a Chic, Western style. Karan also pairs baggy, white blouses with feminine and edgy blue skirts for that Chic Western vibe. Towards the end of the collection, Karan incorporates Indian-inspired Geometric patterns. The finally ends in an array of Beautiful strapless and one shoulder maxi dresses, and shades of fiery orange and tan.